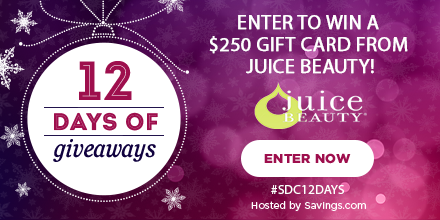 12 Days of Giveaways Day 3: Win a $250 Juice Beauty Gift Card! Welcome to the 12 Days of Giveaways! Each day you will have the chance to win a $250 gift card for a total of $4500 in prizes! Giveaway starts on Monday, November 6th at 12:00 AM ET and ends on Tuesday, November 21st at 11:59 PM ET. Giveaway runs on weekdays only. The winners will be chosen through a lottery drawing and notified on Wednesday (11/22) via the email address they used to enter. Official contest rules can be found on the entry forms at the top of each store’s page on the their designated day. This entry was posted in ARCHIVE and tagged Giveaways, Juice Beauty, SavingsAplenty, SDC12Days. ← 31-Piece Complete Roadside Emergency Kit ONLY $16.99 (Reg. $50) Shipped!